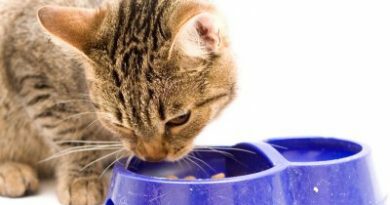 To ensure your cat is getting all it needs, Dr. Perea recommends a commercial cat food that has "complete and balanced” somewhere on the packaging. A seal of approval from the Association of American Feed Control Officials (AAFCO), the group that regulates the pet food industry, will verify the food’s claim. 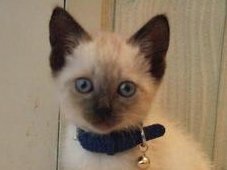 If your cat has an upset stomach, a relatively empty litter box may be your first clue. Cats often suffer constipation, which can be relieved by foods containing carbohydrates, like corn, as well as fiber. "Fiber helps with the health of the large intestine,” says Dr. Perea. She emphatically adds, "They also need enough water!” Make sure to fill your feline’s bowl with clean, fresh water. Change it at least twice, or even more often as needed. 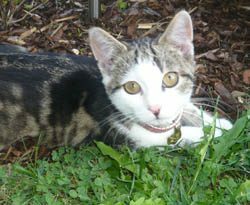 A dry food diet with a relatively larger kibble size forces your pet to really bite down on each individual piece. "This achieves a mechanical brushing action against the surface of the tooth,” explains Dr. Perea. "Other foods on the market may incorporate a calcium-chelating agent on the surface of the kibble. 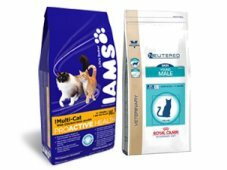 This binds calcium and helps prevent tartar formation.” In order to provide your cat with such a food, look for a diet that claims to promote oral health. The claims should again be verified by an AAFCO seal.